I submitted the following for Adbusters issue #68. They asked for non-fiction, slice-of-life pieces of 200 words or less. While mine didn't get picked up, I still have my blog for sharing it with the world. So here, dear readers, is "Water-park." Trapped in our houses for days by the rain, we were determined to play outside despite occasional drops. Yet after moments, my friend and I, and our children, found ourselves cornered again. This time we were far from our cars, surrounded by a deluge and cowed by relentless booms and flashes as the storm exploded overhead. Twenty minutes passed without it lessening. Huddled under the park’s only portico, sitting on metal benches with our feet nearly covered by fast-rising water, we suddenly felt tingling in our legs as the latest blast hit nearby. “That’s not good,” my friend said, clutching her girls — one sobbing, one silent. I grabbed my son, eyes wide, his hands pressed tightly over his ears. We needed to leave. Afraid that a stroller trudging through soaked fields would become a lightening rod, we discussed what to do. Would staying or going doom us less? I bolted towards the parking lot, my son tucked in, crying as water pelted us. “It’s gonna be o.k. Mama’s got you!” I shouted above the din, holding him closer. We got there. We were lucky. Breathing hard, lightheaded and stunned, I readied us to gather our friends. I was really shaken by the incident I describe, and became more so as I read newspaper reports of what happened nearby, caused by the same severe weather system. Lightning struck and killed two teen boys, and injured another friend with them, as they tore across an open field attempting to outrun the approaching storm. Just another example of how putting on the "parenting ray-bans" makes some things look completely different. Every member of our household, and many visitors who like to read stories aloud, have recently been mesmerized by The Color Kittens. Margaret Wise Brown, author of Goodnight Moon, wrote it, and Alice and Martin Provensen illustrated it. Kittens Brush and Hush mix colors all day long. They see objects that they like and then blend paints to match those objects' colors. I won't give away what color is their favorite. "It was morning. They crawled out of bed into a big bright world. The sky was wild with sunshine. The kittens were wild with purring and pouncing — pounce, pounce, pounce." 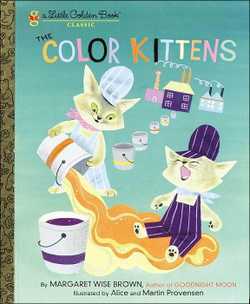 The magical concept of this book is that little kittens, through exuberance and passion for mixing paints, somehow make "all the colors in the world." Very inspiring to young ones — and some old ones, too. First we opened the refrigerator. Then we took out the apple juice. I reached for our stainless-steel milk frother, imagining another use for it. Together we poured apple juice into it, then I released it, with difficulty, into the toddler hands that wanted so much to do it "all by myself." He began to pour the juice into the clear, plastic, rocket-shaped, frozen-treat-wonder receptacles. I reached in to prop up the pitcher's underside. I released again, watching and wondering, What was I so concerned about? He spilled. I took a paper towel and blotted around the ice pop molds. He continued to pour. I want him to have this experience, I told myself. I want him to learn to pour, and spill, and then keep pouring, complely unstoppable, until the ice pop-starts are done. And still part of me wanted to help him do it. Why? Was I that afraid of such a minute amount of apple juice spilling again? 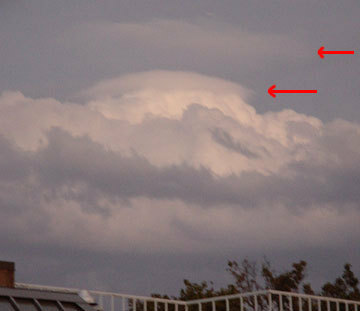 He poured all the way to the top of one of the six molds resting, rocket-ship-tip down, in a tray which held them firmly vertical. He stopped pouring. A slight juice dome bulged over the mold top. We looked at it, deciding. "That one is too full. You can drink some out of it," I suggested. He leaned forward and drank some. Excess juice spilled out. He smiled and leaned forward to drink again. He kept drinking out of the mold until he could drink no more. Then he moved to the next mold and continued. "What about the ice pops?" I asked. "If you keep drinking, there won't be enough to make them." Then I realized we had plenty of apple juice left. He kept drinking, smiling between sips, rotating the tray to move to the next juice-filled mold. I sat down next to him. "Can I have one?" I asked. He nodded, and I took a rocket-ship juice cup out of the holder and drank. It tasted slightly sweet and highly fun. 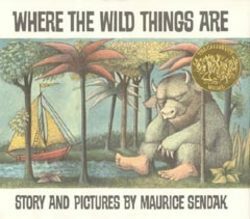 Today is Maurice Sendak's birthday. 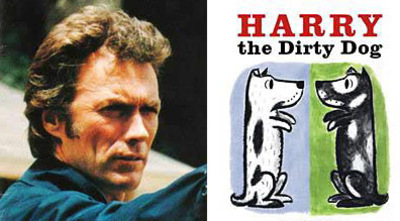 Prolific illustrator and children's book author, his books Where the WIld Things Are and In the Night Kitchen are still among my all-time favorites. Then there's Chicken Soup With Rice, Alligators All Around, One Was Johnny and Pierre — lyrical, memorable, constantly eliciting giggles. And don't forget Higglety Pigglety Pop! with its trademark intelligent-faced animals and chubby babies. "I have written a new picture-book text, and I'm mad for it — and it's mad. I feel so sure of it, something not common for me. It comes from the direct middle of me, and it hurt like hell extracting it. Yes, indeed, very birth-delivery type pains, and it's about as regressed as I imagine I can go. Simply, it's divine." Genius and success look easy, but it's really hard work! Thanks for the lifelong inspiration, Mr. Sendak.